In 2017, there were approximately 2.67 million honeybee colonies in the USA, a slight drop by 2.78 from the previous year. Our depleting bee colonies can be attributed to a number of factors that have weakened them against diseases and chemicals. If you’re thinking of taking the plunge and want to start a new hobby or small business of beekeeping, there are many tips to become a successful beekeeper. With diligent attention, everyone has the ability to efficient looking after bees. Whether you live in an urban or rural area, the essentials of beekeeping and the equipment you need are a necessary knowledge in order to be a productive beekeeper. Every beginner beekeeper should have the basic tools and equipment for looking after colonies and collecting honey. Just deciding on the right type of hive can be confusing so do as much research as possible beforehand. Ensure you choose light-colored clothing as bees find dim colors more attractive, and always wear the correct netted headgear and gloves to protect you. Naturally, hives, covers, frames, smoker, bottom boards and tools are essentially the basics for any amateur beekeeper. However, as you flourish into your new venture, so you’ll find that your kit will expand too so storing everything you need in portable buildings which suit your needs and garden space, will ensure that everything is carefully looked after in an organized way. Of the food we eat, an estimated 70 percent is dependent upon pollination by insects such as bees. 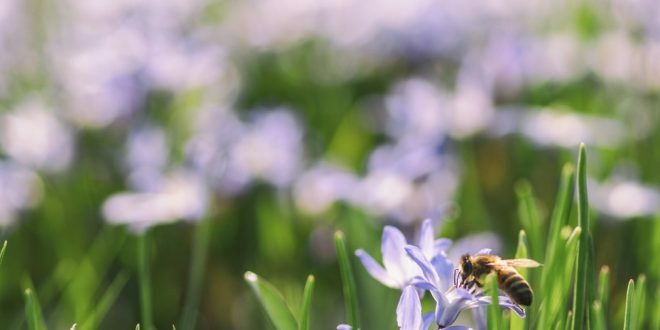 To make pollination productive, bees are more likely to stay in the locality when they have a constant source of food and encourage them to stay in the garden. They’re particularly attracted to yellow, blue and purple blossoms which can be grouped in a specific areas. If you have a vegetable section, its a good idea to plant flowers close to the area in order to maximize the space to attract them. Try and choose plants and flowers that have long blooming or successive cycles or produce high levels of nectar such as cornflowers, marigolds and daisies. It’s also important to provide a water source and have a few trees to protect the bees from winter weather. There are countless reasons why you should do beekeeping but learning these skills takes time and patience. One of the best ways to learn and improve on your beekeeping is to research local beekeepers in your area to find a mentor to help you. Start off small, with maybe two or four hives, and familiarize yourself with the individual personalities of each colony before your build up the amount of hives. It’s also a good idea to get to know the laws relating to beekeeping in the USA, as some of these will differ according to the state where you live. Whether you’re intending to look after bees as a hobby or wanting to start a small business, understanding the behavior of bees in combination with using the correct equipment will ensure your hives are a success.